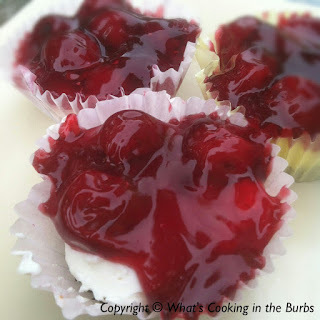 These are the perfect sweet treat when you are craving cheesecake but without all the guilt! They are quick and easy to make which is also one of the reasons why I love this dessert so much! Add liners to muffin tins and evenly divide your crushed graham crackers to each cup. Set aside. Using a hand mixer, mix your cream cheese, sugar, lemon juice, and cool whip until smooth and fluffy. Top each cup with some of the cream cheese mixture, and finish with some of the cherry pie filling. Place in fridge and let set for at least one hour. Enjoy! I love that this is ww friendly! Loved you bringing this to Saturday Dishes. One of my favorites this week. I love cherry cheesecake! Thank you for linking up to Simple Supper Tuesday.